Celebrating Over 100 Years of Family, Service, and Customer Satisfaction! Stay tuned for the latest on the 2020 Newmar Lineup! Since 1917, the Steinbring family has been bringing you the best products and service within the transportation industry. The staff at Steinbring Motorcoach bring you decades of experience in the recreational vehicle industry and is celebrating 100+ years in business and is a 4th generation family business. Along with being named a Blue Ribbon dealer by RV Business Magazine, Steinbring’s has been named an RV Business Magazine Top 50 Dealer numerous times, most recently in 2017 and 2018. Steinbring Motorcoach is your premier Newmar dealer, carrying new Newmar Class A motorhomes as well as Roadtrek & Carado Class Bs. We also have a wide selection of pre-owned coaches and consignments for sale including Class A, Class B, Class C, Diesel Pushers, and Toy Haulers. 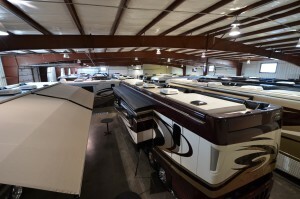 Our team of Newmar Professional Product Institute (NPPI) certified sales and service experts are ready to help you find your next motorhome, or service your existing one. Our award winning sales team is complemented by an award winning service department. Named one of only three Newmar Diamond service centers in 2019, Steinbring Motorcoach is a 7 time Mahlon Miller Service Excellence award winner, a 14 time Newmar Customer Service Excellence Award winner including the highest ever customer service score of 99.6%, and has been awarded the Newmar Delivery Excellence accolade every year it has been presented since 2013. Located just off I-94 in the small town of Garfield, Minnesota, our dealership features a large indoor showroom showcasing inventory from the gas Bay Star and Canyon Star, to the Ventana, Dutch Star, and New Aire diesel pushers, the Newmar luxury lines including Mountain Aire, London Aire, and Essex, along with our selection of Class B Roadtrek and Carado RVs. Honesty and integrity is at the core of the way we do business at Steinbring Motorcoach. You can trust that you and your motorhome will be treated with the highest level of respect. Whether your are working with sales or service, we will go out of our way to see that the work is done right and that our customers are well taken care of.